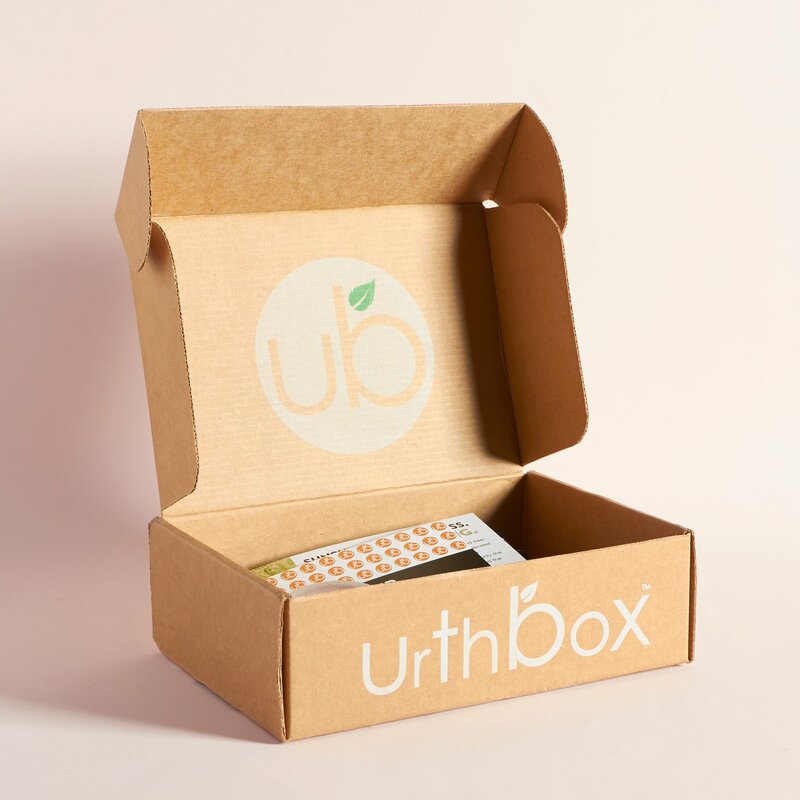 UrthBox is a monthly subscription that introduces subscribers to delicious and healthy new snacks. Every box includes a selection of non-GMO, organic, and healthy snacks, beverages, and more. Subscribers select from four different box sizes and the following versions: The Classic, The Gluten-Free, The Vegan, and The Diet. This review is of the Mini Vegan, $12.99 a month, box. COUPON: Use code PROMO10 to save $10 off your first box! 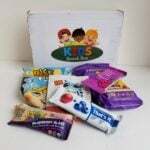 The Products: Safe, healthy, and natural snacks and beverages from trustworthy brands. Ships to: Free shipping to the US, $6.95 to Canada, and $14.95 a box worldwide. Check out all of our UrthBox reviews and the Food Subscription Box Directory to discover other snack subscriptions. 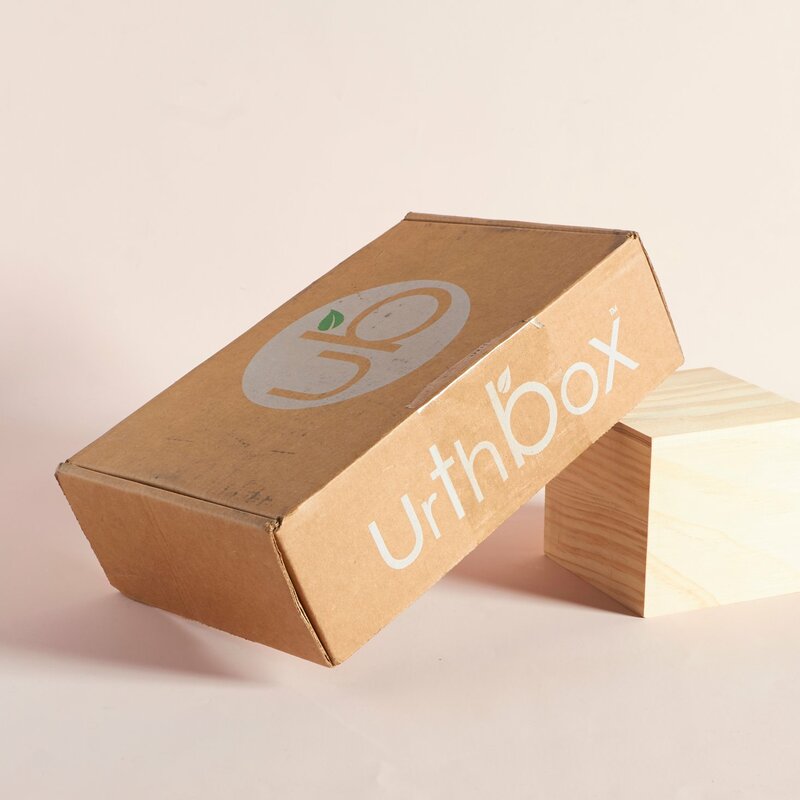 UrthBox has a member plan that lets you earn credits by sharing UrthBox on social media. These are so good! They remind me of the fruit drops from Graze. Yum. They are very sweet, all the sugar comes from fruit juices, and I gobbled them up. The perfect, sweet 70 calorie snack. Jessie’s Nutty Cups are made in New York with house-made peanut butter or almond butter. The cup I got in October’s UrthBox was dark chocolate sprinkled with sea salt with peanut butter inside. The dark chocolate and sea salt were perfect together but the peanut butter filling was drier than I expected. I definitely prefer a creamy, smooth filling but the overall taste satisfied my peanut butter and chocolate craving. Here’s a peek at the inside of the cup and a better look at the filling. This Chocolate Coconut bar was much sweeter than I expected. It is packed with fruit purees and dried fruit to give it a sweet, fruity taste. After being surprised by the fruity taste in my first bite, I started to notice the chocolate, coconuts, and oats. Overall, I think the bar was a little too sweet for me, but I do appreciate that a lot of the sweetness was from fruit, in addition to brown rice syrup and molasses. The is gluten free and soy free and has 7 grams of protein from pea protein. I love cherries and anything salty so this bar was a hit for me. It had a chewy texture and tasted more like a treat than an energy bar. The bar is gluten free and is packed with chia seeds, quinoa, and flax. This is definitely something I would pick up for a between meal snack (or healthier treat!) if I saw it in a store. This chocolate bar had great, colorful packaging protecting the large square of chocolate within. It had the light bitterness of dark chocolate with notes of chocolate and caramel. I really enjoyed this chocolate bar. It was perfectly sweet with complex flavors. The bar arrived broken into a few pieces but that was no big deal, it made it easier to snack on! I share this with some friends and they really enjoyed it. These were so good! I love anything salt & vinegar flavor (much to my husband’s dismay) and these were very tasty. The roasted fava beans reminded me exactly of roasted chickpeas, another favorite of mine. I appreciate that UrthBox included this sample in the box to add a salty snack to complement the sweetness of the rest of the box. Reaching for salt & vinegar fava beans (full of fiber and protein) is much healthier than potato chips. My husband, Andy, and I both tried this little chocolate bar and it wasn’t a hit with either of us. The texture was soft and buttery but the flavor had a sourness to it that we didn’t like. The bar was a melted on one end when I opened the packaging. The design on the small chocolate bar is a nice touch and works well with the branding. I popped this minty gum in and was surprised by the way it crumbled upon chewing. It didn’t soften quickly like most gums and instead broke into pieces and required a bit time to work into typical gum texture. A strong flavor emerged that tasted like artificial sweetener and it was too much for me to handle. I have to be honest and say I spit this out immediately. Looking around at other reviews, it sounds like people either have this same reaction or love this gum for the caffeine boost before working out. Verdict: This box had a total value of $18.82 which is just ok for a $12.99 box. The highest value item (almost $9) was a large chocolate bar and was probably my favorite item in the box. I like to have vegan energy or protein bars around as a quick breakfast on the way to the office, so I was pleased to try two new ones. The gum and small chocolate bars were misses for me but I did like the free sample of salt & vinegar fava beans. I liked this box for discovering new vegan treats I have never heard of, and I like that they offer different options for different dietary needs and preferences. Do you subscribe to UrthBox? What did you receive this month? This box seems better than my love with food box. I put it on my wishlist.. Love that chocolate you got. Nice addition.